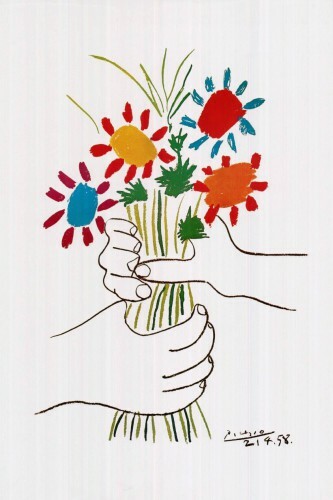 Picasso’s flowers. – Nice dress! Thanks, I made it!! My sister asked that I use her favourite skirt pattern, McCall’s 4408, a 1989 vintage pattern. I did the box pleats as usual, carefully measuring and folding the fabric. My sister asked for an elastic waistband in the back only and she wanted two rows of narrow elastic, not one row of wide elastic. This time I thought of a different method than the last skirt. 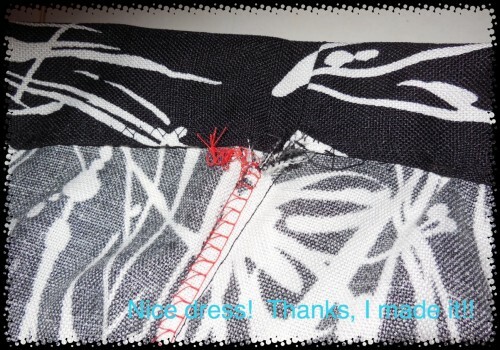 I sewed the waistband front and back together and on to the skirt as usual and folded it to the inside. I edge stitched the waistband all the way around the top edge, both front and back, with my blind hem foot, and I sewed one row in the middle of the waistband on the back piece for the first casing. I edge stitched again on the bottom of the back waistband piece to complete the second casing. The two narrow elastics were pulled through their back casings and secured with safety pins to the front waistband (which was still open) and then the elastic ends were sewed down along the side seams. I then sewed the front waistband down at the bottom edge and my waistband is done. I love that this skirt has hidden side pockets! And… Petunia (oh! I mean my sister) has another new skirt! Two skirts down and one to go – “The Snakeskin” is the next one. Well, I’m on vacation now so I probably won’t be posting until perhaps the first weekend in September – lots of visiting family and having them visit us, YIPEE! I’m going to perhaps do some blog maintenance too. Hopefully I don’t mess anything up and lose you… or you lose me! Please keep posting as I would love to have something to read during those quiet times in my days! Love a good black and white print and this one’s a great one. Enjoy your hols! Thank you for the compliment and the wishes! This is a lovely skirt. How did you come up with the name Picasso ‘ s Flowers? How did you make the connection? I know it’s a huge leap for someone who is an artist and familiar with Picasso’s work. I could not actually remember any of Picasso’s work while we were shopping but I knew he had done abstracts and I knew he had done flowers and in this fabric I see many abstract flowers, perhaps they are easier to see when the fabric is flat out? It’s beautiful fabric anyway. Love it! The print looks pretty cool too. Very pretty! Thank you for posting the construction bits, so helpful to see how it all comes together. Enjoy your holiday! Thank you! I love instructions and diagrams in my patterns, in my sewing books, etc. sometimes the words don’t quite make sense and a picture helps! Loving the black and white print too, works really well. Have a lovely break! You are really a caring sister to sew so many garments for your sister. Wish you a lovely holiday! Guess what is on my sewing table right now? 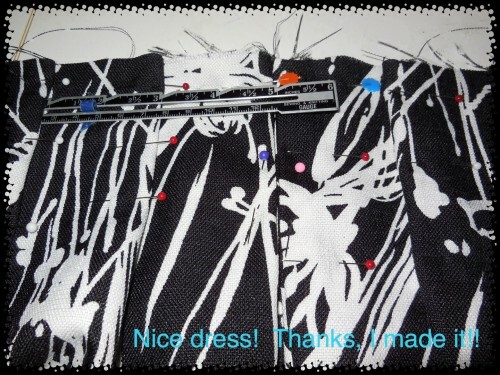 Pants…..I already Made three Muslins and now the Fitting Starts. 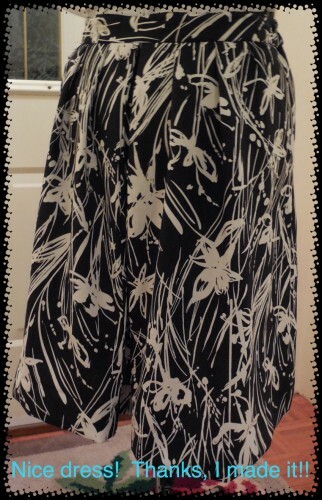 I tend to procrastinate this..
Great print & I love pockets, too! Very pretty pattern. It will look great on your (my) sister. I like this fabric Linda and the skirt you made with it. I had not thought of two rows elastic, nice idea!! Thank you! It’s my sister’s idea. It keeps the skirt on but doesn’t cut into your waist as much! Oh i like how the casing of the elastic band looks so neat! Love the fabric👏. You are an awesome sister. Once again a masterpiece. I do hope that I will not have to wrestle Petunia to the ground to get my skirts. She does look beautiful, but a bit of an air head though l have heard. 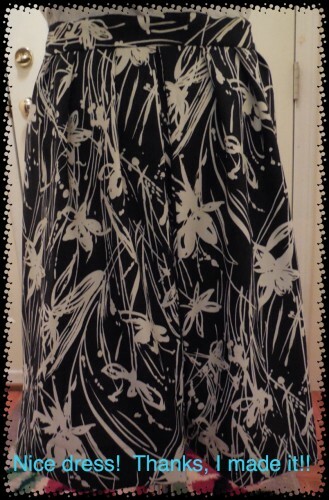 I have a lovely black, 3/4 sleeve light sweater that will look beautiful with this skirt. I am going to owe you big time by the time you are done. The inside of that skirt looks as great as the outside! Great fabric choice for that cute vintage pattern. The hidden pockets are a nice detail – so rare in current pattern offerings. Lucky sister!! So, I spent part of my holiday with my sister and got my first peek at the skirts that she had finished and they were wonderful. I was lucky cause Petunia was no longer wearing them so I didn’t have to fight with her to get them back. The work you are doing Linda is beautiful. Thank you. You are very welcome! 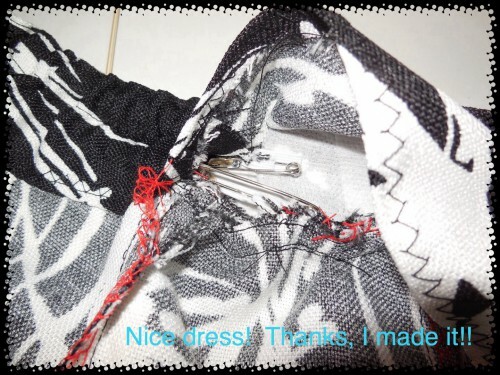 It’s nice to have a change in my sewing routine… And I am so glad you came over… It was fun! See you soon! I know. I have to keep looking it up and doing the math. Apparently it’s just on the edge, which kind of makes sense because it seems like yesterday for me too! The pattern did say it should be mid-calf, but we wouldn’t stand for that! Come to think of it, I stopped counting years when I was about 25! One thing I have noticed (having so many vintage patterns) is that the one thing that has definitely changed is the selection of materials. Back, in the day, there were no real lively prints on material. My selections went mostly to cottons, my previous skirt were a cowboy theme, kitchen spices and roses on a black vine entwined background. I drew the line at materials my aunt used to wear that I still see often in western movies. You must admit the Clark Cable and Picasso are a 180% turn from kitchen spices! I agree! There is so much to choose from, it is hard to choose! (I prefer to choose it all!). You made some lovely choices there Rose. They will be great additions to your wardrobes! Love it.. I like how you did the casing.. So neat and professional. I never thought elastic can looks so amazing.. I definitely learned something from this.. Thanks for sharing Linda. Thank you, I am… Did… Was…??? 😀 It’s over now, but I am trying to get myself back into the swing of things again… Work, kids’ school, sewing, exercise, healthy eating, blogging. You never know how busy your life is until you stop doing everything and relax, and then try to get back into it again. But I’ll have a new blog post ready for this weekend! Talk soon! Well done for doing so much sewing before you go off on your holidays. Enjoy yourself Linda!